Lucky for us, it's Tuesday!!! 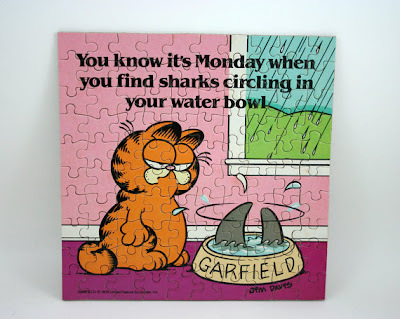 Phew, I would hate to find sharks in my morning cereal. Anyway, it's catch-up time with my beloved bloggies and bookworms. I know I've been absent on and off for a while now, and I feel extra bad about it. Especially because Fangirling Misses 1st year Blogoversary just passed on the 4th of March. I KNOW. I'm the worst head blogger ever. Excuse me while I go cry in a dusty corner. However, I'm back! I've been slowly getting back into the bookish scene, reading a book here and there, writing down some musings here or there.....and I think I'm finally ready to start posting again. It's been a tremendous change for me to start school at an actual physical institute with lots of peers and distractions again, and I'm only just starting to get used to it. It can be hard, because you think you've got it all under control and then you get another set of assignments and it starts all over again. The trick is time management, which is a skill I've spent the last month chasing around like a mad woman. But no matter how hard it gets, it will get better. Eventually. Also, I've been tagged sooo many times by my fellow bloggers and in some cases I haven't even responded and said thank you. I feel terrible about this in particular. The truth is I feel so honored that anyone in the blogosphere thinks I'm worthy of anything, so I try to be very diligent when it comes to acknowledging them back. If you are one of these bloggers who tagged me for something and I haven't had the time to say thank you, I say thank you RIGHT NOW. THANK YOU THANK YOU THANK YOU. Lastly, the blog itself is in need of work. The tabs and pages in the top bar are incomplete, I haven't quite decided on my final review template, and I'm still working on the commenting system. I was going to change to Discus because currently you have to have a G+ account to comment on Fangirling Misses, something that I feel is very restricting, and a few of my readers have contacted me and mentioned that they would like to comment but they don't have G+ accounts. However, I would lose all my current comments (QUEUE THE CRYING) and couldn't get Discus to work anyway. So I'm kind of stuck at the moment in that regard. If anyone has any suggestions give me a shout out, I'd love to hear from you. I suppose I should leave you all now, I think I've exhausted my typing fingers....but just so you know, I'm not dissapearing. I love blogging and I will be up and posting away in no time.